Yes, everyone is talking about different ways of thinking about the Minimum Viable Product (MVP) so I thought I’d throw in my thoughts on building a product that people love (and pay for). Yes, there is a laundry list of terms that “redefine” the Minimum Viable Product (Minimum Valuable Product, Minimum Lovable Product, Minimum Meaningful Product, and Minimum Delightful Product), but it’s a worthwhile exercise to think about how delight impacts people and affects your ability to build products people love. Like many in the product world, you’ve found yourself talking about the minimum set of features a product must have to validate the solution and business model. You probably have been frustrated by one camp’s desire to strip a product down to its bones making it feel like a life jacket in a sea of yachts. And then you face the other camp whose vision is to build Disney World in a neighborhood park. Somewhere in between these camps is the product you need to put out there for people, but how do you get there? One of the problems people face when thinking through an MVP isn’t the features themselves, but the battle between which features make or don’t make the cut into your product. So, I offer another way of looking at product development. Here’s the way I see the Minimum Delightful Product (MDPC). The Japanese are fanatical in how they think about quality, best exemplified by lean manufacturing and the Toyota Manufacturing System. They have two words, atarimae hinshitsu and miryokuteki hinshitsu, which describe the two different types of quality that exist in products. Aatarimae hinshitsu describes things that work as expected. Miryokuteki hinshitsu describes things that have unusual beauty or delight. I believe this is a great framework for how we could think about product features. Product features can either be expected or delightful. The great documentary Objectified by Gary Hustwit, which the relationship between products and their design, highlights the design of a delightful toothpick. 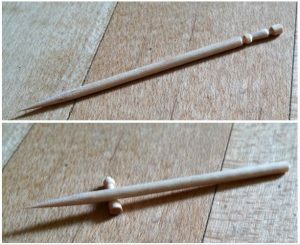 The toothpick has what you’d expect of it – the ability to scrape food between your teeth. But it adds delight by allowing the user to break off a portion of the blunt end to use as a stand allowing the user to put the toothpick down without the tip touching a potentially dirty surface. It is somewhere between expected features and delightful features that a customer feels satisfied with your product. The best delivering expected features can do for your users is to keep them from getting mad. No one feels satisfaction from simply having expectations met, so don’t pat yourself on the back for meeting expectations. All you’ve done is get to “par”. It’s delight that is the difference between meeting expectations and delighting people. The husband who brings home flowers on Valentine’s day may simply be meeting expectations, but the husband who brings home flowers as a random expression of love creates delight. Due to the nature of these two types of features, users typically request expected features, but rarely request the delightful ones. Afterall, a sense of surprise is inherent to creating delight. Simply talking about expected versus delightful features would leave this process empty. The delightful features must be thought through in the context of the customer journey. Potential users consider your product when your product meets their set of minimum expected features. These potential users generally know what they are trying to do when looking for a product and they use this expectation to either reject or consider a product. How you talk about your product and how people understand your product are the building blocks of whether or not your product is even considered. Once users feel that a product has enough features and a basic sense of confidence that the features will work for them, they become paying customers. But you’re not in the clear yet. All you’ve done is meet initial expectations. Once they start using your product, they will develop expectations that they didn’t know they had. Once they’ve made the purchase, it’s your opportunity to shine. Delightful features will move a paying customer to a loyal customer who buys over and over. This is the first milestone of seeing which delightful features work and getting feedback from customers that they like your product. This is where you have built a product you can be proud of. Don’t stop at loyal customers! It isn’t enough to build a business where you have loyal people who only keep buying your products. For a business to thrive, it must have people who are fans, people who tell others about your products. When you have the right combination of expected and delightful features, you’ve gotten to that place where people love your product. And when you love something, you naturally tell others about it. Think about what they share with others. Do they talk about the features that met their expectations or the features that created delight? If you want word-of-mouth, you have to create delight. One of the most delightful features the Tesla Model S had was its Ludicrous Mode which maximizes all available torque allowing the Model S to go from 0-60 in 2.5 seconds! Tesla recently started delivering the Model 3 at a price point for the rest of us and one of the first questions that came up about the Model 3 was whether or not Ludicrous Mode, this extremely delightful and high-end feature, would be included in the Model 3. This is a great example of a delightful feature evolving into an expected feature. You can see examples of this all around you. What was once new and shiny, becomes the next baseline minimum. I still remember the days when air conditioning in a car was an optional upgrade! Satisfying your customers is a constantly progressing target. What once satisfied your customers won’t satisfy them in the future. This product management system should be thought of as a continuously iterative process (a continuum) applying to the first product and every product iteration thereafter. Too much emphasis is given to the first, go-to-market, product rather than emphasizing a disciplined and continuous approach to product development. Whether it’s finding product-market fit or refreshing a product after maturity, the Minimum Delightful Product Continuum applies. The Minimum Delightful Product Continuum is more than just how you think about your initial product launch. It’s also how you continually think about your product’s evolution. I know I’m not saying anything you don’t know, but product management and product development aren’t about chasing new ideas. It’s about being disciplined and constantly remembering that this is a part of life and the human condition. The next time you release a new delightful feature people love, then start to complain about because it doesn’t do X, take a deep breath and remind yourself that it’s OK. Keep fighting the good fight. What you, as a product leader, are doing does matter. You have an incredible opportunity to help and make a difference in people’s lives. You have the privilege of working with talented people to create things that reflect humanity. I believe people thrive when they create and that’s what you get to do. Have gratitude and work to create delight in this world. I have a confession. I’m afraid of flying. I don’t like airplanes. I fly about once a month, but yet I can’t shake the feeling. And I know why I’m afraid to fly. Don’t tell me that flying is statistically safer than driving. With my mechanical engineer side, I think about everything that has to go right to fly. From the combustion of highly compressed fuel and air to the mechanical systems that control the flaps to give you the right stability, there’s a lot of things that have to go right. But I’m afraid of flying because I have no control over these things. I certainly don’t have control over gravity. I find my fear foolish yet I’m unable to get over it…not being in control that is. Maybe you’re like me where you want to control as many of the variables you have in your life. Maybe you’re working hard to save money. Maybe you’re addicted to planning. Or maybe you like doing things solo. Whatever it is, just be reminded that control ≠ peace of mind . It feels like it would, but it doesn’t in the end. It’s because you can’t control outcomes. There are only two things you can control: attitude and effort. Attitude is the pursuit of excellence, your response to circumstances, your commitment to learning, and the depth of your focus. Effort is your grit, your unwillingness to give up, your discipline and your level of intensity. The rest…the outcome…it’s out of your control. So here’s to flying and letting go of the things you cannot control.